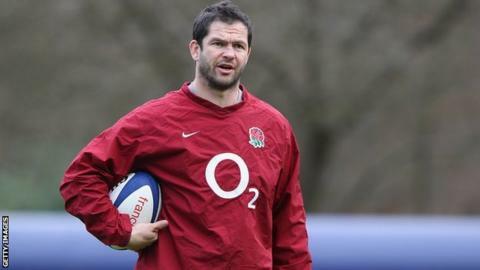 Andy Farrell has said the thrill of matches like those against France and Wales persuaded him to leave Saracens and join the England coaching staff. Farrell became backs coach in June after a spell on Stuart Lancaster's staff during the 2012 Six Nations. "I still think about Paris [when England beat France 24-22] and the Welsh game [which Wales won 19-12] - the atmosphere," he said. "It doesn't get much better in top-line sport than those occasions." He added: "We believe there are many more of those to come and that's what we want to be involved in." The 37-year-old shared his international duties with his role as Saracens first-team coach during England's Six Nations campaign. He initially turned down the opportunity to join head coach Lancaster and forwards coach Graham Rowntree permanently in the England set-up. But the former dual-code international quit the London club in June and signed a three-year deal with the Rugby Football Union four weeks later. "We had a great time when I was doing the interim job," he said. "I wanted to be involved [with England] but the dilemma was so great. "The hardest point was the emotional connection, at a cut-throat time in the season, with a club that has been good to you. Ultimately, you don't want to let people down. "At the back of your mind you have the chance to go on this journey with the national side, working with the cream of the country against the best in the world and at the start of something special."